With a full house at the Complejo Ferial of Puerto Rico in the city of Ponce, the World Boxing Organization (WBO), chaired by Francisco “Paco” Valcárcel, Esq recognized the future stars of Puerto Rican boxing and the companies Miguel Cotto Promotions, PR Best Boxing, and Spartan Boxing Club for being at the forefront of the sport. “We have to rule boxing around the world, but there is always something that calls you that is your homeland and that is part of something we are doing today, a recognition to the boxers that are our champions from different divisions and to the prospects that are coming up with a desire for them to stay on the positive route and be examples to their people”, Valcárcel expressed. Each fighter mentioned received a miniature replica of the WBO world championship. The current WBO regional champions who live in Puerto Rico were part of the festivities and were recognized by way of radiant promotional posters decorated the event. They also received commemorative watches from the organization. These honored champions are: Wilfredo “Bimbito” Méndez – NABO (105 lbs), Víctor Bisbal – WBO Latino (200+ lbs), Jean Carlos “Lobo” Torres – WBO Latino (140 lbs), Luis “Popeye” Lebrón – WBO Latino (126 lbs), Jeyvier Cintrón – WBO Latino (115 lbs), Yenifel “The Lightning” Vicente – WBO Latino (122 lbs), Lenin Castillo – WBO Latino (175 lbs), Jonathan “Powder” Oquendo – WBO (130 lbs) and Jonathan “La Bomba” González – NABO (112 lbs). 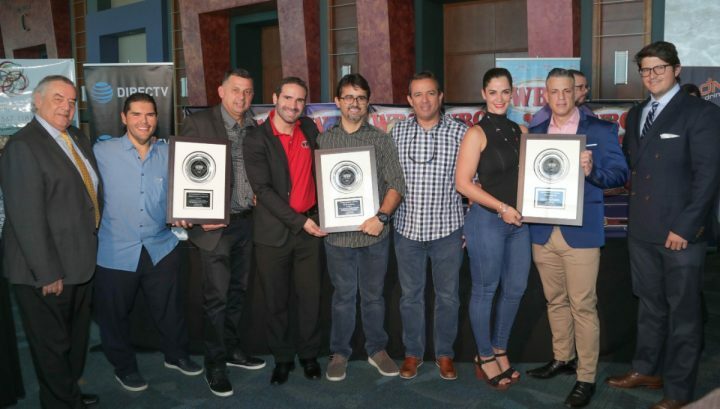 The WBO awarded prizes to promoters PR Best Boxing and Miguel Cotto Promotions, the management company Spartan Boxing Club, and manager Juan de León, for their help and support to the development of young prospects inside and outside of Puerto Rico. “These companies have about 25 or 30 undercards per year on television and they are all producing WBO champions. They work hard for boxing and that must be acknowledged”, said Valcárcel. Trainers Anthony Otero, Dennis Pantoja, Jesus “Tongui” Ortiz, Yoel “Yowy” González, Félix Pagán Pintor, César Seda, former world champion Samuel Serrano, former NABO champion Daniel Alicea, referees Ramón Peña and José H. Rivera were also present. Judges César Ramos and Hernando Steidel, the managers Raúl Pastrana, Willie Silvestry, Peter Rivera and Margaro Cruz and the vice president of the Spartan Boxing Club Mayra Pastrana also attended. For the WBO, Treasurer Adolfo Flores, Vice-Chairman of the Championship Committee Enrique Mendoza, Esq, Ratings Committee Chairman Edgardo López Sasso, and adviser Gustavo Olivieri, Esq were also in attendance.